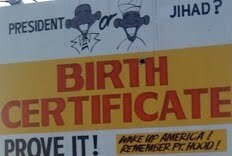 • “Remember Fort Hood” says the Colorado billboard implying President Obama is a dangerous Muslim. "Since Fort Hood, I've had it," owner Phil West told FOX 31 News Friday. "You can't suggest things. You can't profile. You gotta call a spade a spade." • “The man who did that shooting in Texas…” muttered the woman shopping in the Jewel grocery store before assaulting another shopper, a Palestinian-American woman in the hijab. A suburban Chicago woman has been charged with a hate crime for allegedly yanking the head scarf of a Muslim woman in Tinley Park two days after the shootings at Fort Hood, Texas. Where were these bigots when, in 1991, the worst massacre in Texas was committed in the town of Killeen, next to Fort Hood? George Hennard killed 23 people in a local restaurant. "He hated blacks, Hispanics, gays. He said women were snakes," recalls Jamie Dunlap, who briefly shared an apartment with Hennard in Temple, Texas, that year. Let’s for a moment accept the idea of these bigots who think that the more recent shootings at Fort Hood tell us something bad about people who share the shooter’s ethnic background or belief system. If that is true, then the 1991 shootings there tell us something twice as bad about them! Of course, both propositions are false – but it is sad how people generalize when the perpetrator is from a minority group, but completely fail to do so when they are from the dominant group.